Why Choose Joe Isaacson Dental for Dentures? A partial denture, commonly referred to as simply a partial, consists of multiple teeth on a gum colored base. The teeth are not in a row but rather spread across the base to fit like a puzzle with your existing teeth. 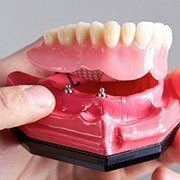 A partial is normally secured with clips or brackets, but unlike a bridge, a partial is removable. What is a Full Denture? Dental implants are small titanium posts anchored into the jawbone. 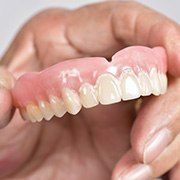 If you prefer a secure full or partial denture and do not want clips or adhesive, then consider implant-supported dentures. During a brief surgery, an implant dentist like Dr. Isaacson can secure a few dental implant posts to hold your dentures in place. 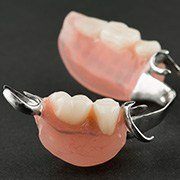 With implant-supported dentures, you won't have to worry about slippage, and your prosthetic will feel safe and sound.